An amazing weekend on Cherry Lake. Amazing because we had three upper thirties caught and some of the Carp have been spawning. We have also had our 100th member of the 30+ club. Wow! The three anglers on the Cherry Lake Lodges shared some 20+ Carp between them. Gary Smith who was visiting for the first time had an impressive 6 from Heron Lodge to 24lb. Tom Nixon-Taylor who is an exceptional young angler had around 10 over the weekend including a 38-12 and 35-04 Mirrors. I have not included details here because I am waiting on some photos and possibly a video. His results deserves a story all of his own. Watch this space. Joe Baker first visited Cherry Lake in May and loved it so much he booked a quick return this time choosing Grebe Lodge. On arrival Joe made sure what number we were up to with the 30+ club and when told that we were at 99, he said ‘I am going to be the 100th member’. He was delighted when he left this morning, as he is the 100th member of the Cherry Lakes 30+ club. He had a great weekend catching 8 Carp, including two Commons of 26lb+ and a Ghostie of 23-08. I was delighted to get a very early morning call when he smashed his PB at 04.00 on Sunday morning with a 35-04 Mirror. 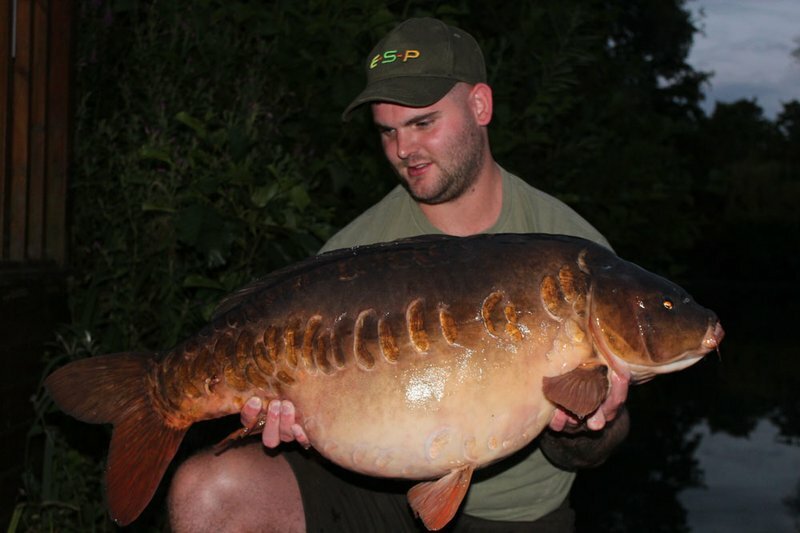 Joe baited reasonably heavily throughout his stay using both the Cherry Lakes Spod Mix and Fish Supreme boilies. Well done Joe. Whilst the Pretty One is an absolutely fabulous fish and a great PB for Joe, I will confess to have been disappointed when I saw her in the net, as this is the third time she has been out in the last two weeks. She continued to look in good condition and is steady in weight, but it is hard to understand why she has lost her natural caution and we have our fingers crossed that it is not an ominous sign for her. From my perspective I would like her to ‘disappear’ until next Spring! We have also had groups of Carp spawning this weekend on Cherry Lake which has shocked both fishery manager Dave as well as myself. Given how hot the weather has been for a long while we thought they had long since finished. Our best guess is that some of the smaller female Carp had not fully ‘discharged’ all of their eggs? As far as I know (and I would be delighted to hear from anyone who knows better) once a female Carp has spawned then that is it for a year as it takes a long while for her to ‘make them’. We also assume ‘randy male’ fish can fertilise females repeatedly (sound familiar?!). Either way it clearly did not stop the majority of the Carp from feeding!